Gikany and Una really enjoy this series. It’s a fascinating, engaging, and fun series. How can it not be fun? It mixes werewolves, SWAT, and romance together. 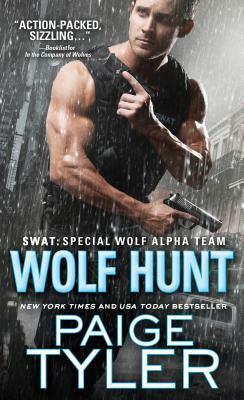 Ms. Tyler delivers yet another satisfying SWAT novel in Wolf Hunt. Although the series is best read from the beginning, Wolf Hunt would be a reasonable start for the series. The best part of Remy and Triana’s romance is that it is a second chance at love. Remy and Triana were unrequited high school sweethearts. Friends for most of their childhood, they never took that next step fearing it wouldn’t work out. When they run into each other on a visit home they receive that second chance at love. Their romantic journey, although overshadowed by Remy’s past, was sweet, passionate and fulfilling. We enjoyed learning about Triana’s family. Her mother, Gemma Bellamy, runs a Voodoo shop and seems pretty knowledgeable about things that are supposedly only a legend. Triana’s mother provided not only a little comic relief but also a strong supporting character. We enjoyed her courage and strength of character. The way she helps Triana accept the supernatural despite Triana’s scientific mindset was touching. We enjoyed how the nefarious plots of the drug kingpin, the hurricane, and the insistent mysterious buyer for Triana’s father’s necklace all seemed to weave together. The twists and turns were enjoyable, although they were a little predictable. SWAT continues to be a fascinating series. In each novel we learn a little more about the nature and mythology of werewolves in this world along with a satisfying romantic journey with a bit of action and suspense. If you like a little hunky werewolf in uniform, you may just want to check out this modern day paranormal cop drama series.